I have to start with the off the field issues at Blackpool at the moment, they are really sad to see. I was aware of discontent with some supporters when I signed, and to see what has gone on in the time between then and now is quite startling, although not that unexpected to be honest. The hatred and bitterness some feel towards those at the top looks like it’s gone past the point of no return – these are dangerous times. I supported my local club because my dad took me from a young age. I got the bug as a kid, and once you have a team, that team stays with you for life,. With the current situation of supporters staying away, I believe the club are risking losing a large amount of the next generation of supporters. I can not imagine in what circumstances I would ever boycott my football club or wish defeat on the team as I’d feel that is the only way things will improve in the long term. Unfortunately this seems to be the case now for a large group of Blackpool supporters and that means something is deeply wrong. My season spent playing for Blackpool FC was my proudest as a professional footballer – a club with such a great history, great support, a proper football club. Driving up to Bloomfield Road on a match day was amazing, seeing all the tangerine shirts outside the pubs and cafes, it was brilliant, it made you feel 10-feet-tall. Stepping up so late in my career to play for Blackpool in the Championship I knew some supporters would be very underwhelmed, but if they saw I gave them total commitment from minute one, it would be a good start to winning them round. I’d like to think people will look back at my time in a Blackpool shirt and remember my commitment to the cause. First and foremost I’m a football fan, and when I go and watch my club play, I want to see total commitment. I could always take watching Middlesbrough (my team) get outplayed by a better side, but what you can’t take as a supporter is leaving the stadium feeling the players could have given more – that they still had more in the tank, that the opposition simply wanted to win more than they did. 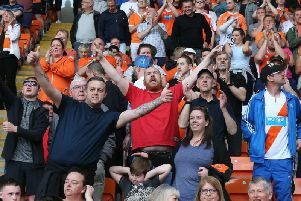 It’s incredible to think our team managed the best start to a season Blackpool FC has ever made – I think I’m correct in saying that’s still the case. In fact when we beat Sheffield Wednesday at home in early December to go fifth in the Championship at that point we felt anything was possible. One thing about that squad we had, is winners, personalities that took each defeat like it was a personal insult to them. Ability-wise, we punched above our weight the early part of that season, but nobody out-worked us, nobody outfought us and tactically we were well disciplined. We had to be, the manager played the cards he was dealt very well, we couldn’t play attacking, expansive football, we just didn’t have the players for it, but we played to our strengths, and did it well for the first half of the season. Just before Christmas we badly achieved and in the end survived by the skin of our teeth. People tell me we were lucky to stay up, I don’t take that. After 40-odd league games you end up where you deserve to be, and we acquired enough points to be safe, just!. A big disappointment for me is when you fight for a season to preserve the clubs Championship status, is to see it surrendered without fight the following campaign. This is not a attack on the players, circumstances made it basically impossible for them to survive, god only knows what the players who took the club to the Premier League must be thinking! As I get ready to play against them tomorrow, I’d thank the people of Blackpool for making me and my family feel so welcome during the time we spent there. I’m not kissing backsides here, but the warmth shown to us was amazing and I’d just like to place on record how much we appreciate it. I was aware when I signed I’d have to win the supporters over and I felt they appreciated the effort I put in for them (whatever position I played in)so Saturday will give me a great opportunity to go down to the away fans after the game and say thank you, whatever the result. I’m enjoying my time at Scunthorpe and hopefully I’ve got a few good years left in my legs yet. There are big plans in place here and with a new stadium on the horizon and the chairman stating he wants us to be in the Championship sooner rather than later. It’s a challenge I’m relishing.